Chosen by Edge Architects to feature prominently on the building's southern elevations, Bondor Equitilt has been used to fulfill the school's need for twin basketball courts, larger teaching spaces and improved climate control. Architect Peter Spain specified the panels be made from COLORBOND Metallic steel in the colour Skybridge. "The panels help the gymnasium stand out from the other buildings in the area. They give it a different profile, and overall they give it a lift when combined with the glass section below," Mr Spain said. "Other similar products were considered, but Bondor Equitilt was selected as it is an Australian-made product," he added. Bondor produces self-supporting lightweight structural panels which can be used in a number of applications including schools, public buildings, housing, cleanrooms and cold storage facilities. Bondor panels comprise a sandwich of expanded polystyrene (EPS) between COLORBOND steel. They provide structural and thermal efficiency combined with a durable finish and the aesthetics of COLORBOND steel. "An advantage of Bondor panels is that no extra insulation was needed. The colour finish is featured on both sides so no brickwork was required," said Mr Spain. "It was easy to make the large spans required for the project and it all went up quickly." 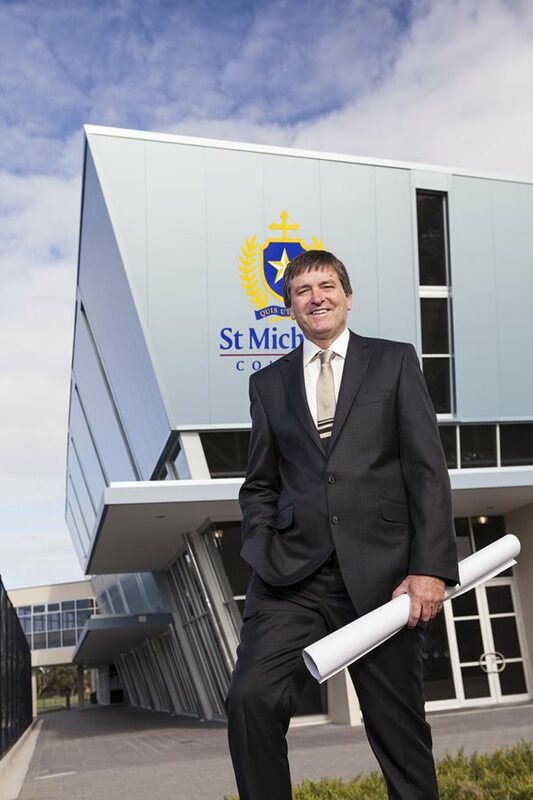 Approximately 500 square metres of panels were used in the St Michael's College project. Both the steel and EPS components of the panels are fully recyclable and the surface does not require repainting. Since it was commissioned in November 2012, the gymnasium has had a six-month service interval, involving a freshwater wash-down of areas not normally exposed to rain to ensure optimal durability. Impact Cladding Systems installed the panels and proprietor Wayne Perkins' said Bondor Equitilt offered several construction advantages. "They are more efficient as an insulation medium than pre-cast concrete of an equivalent thickness - and the finish is very good compared with other cladding products," Mr Perkins said. "We also liked dealing with the product because Bondor has local representation, it just makes things easier." State Manager of Bondor in South Australia, Michael Erwin, says that the use of Bondor Equitilt panel in the gymnasium's construction allowed for a faster build than would have been possible using traditional materials, such as brick and concrete. "Considering the 17-degree angle of the building's walls, Bondor Equitilt simplified the building process," Mr Erwin said.